Companies requiring additional capital may offer shares for sale to their shareholders in proportion to their existing holdings, usually at a discount to the price in the market. Such issues initially gives existing shareholders securities called rights. Shareholders get the right to purchase new shares at a discount to the market price on a stated future date. Rights usually, have value, the difference between the current share price and the exercise price. Until the date at which the new shares are to be purchased, shareholders can trade the rights, similar to the trading of shares. Rights may be listed on a stock exchange, in many cases, they are not, but stockbrokers can usually arrange for sale and purchase of them, nevertheless. Rights can be renounceable or not and that is determined by the company’s shareholders usually at a general meeting. If they are non-renounceable then shareholders will not be able to transfer the rights to a third party if they do not intend to exercise them. The PE is the most common measure of valuing stocks and understanding it’s use is critical to successful investing. 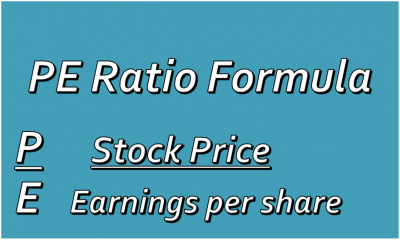 It is computed by dividing the price of a stock by the earnings for each share. This is important since various companies have different earnings and number of issued share. Why is the measure important? Investors are buying an intangible which is future income, the PE tells how many years of profit or earnings investors have price into a company’s stock. For example, take the hottest stock around now – NCB Financial, this publication projects the group to generate earnings next year of $17.5 billion after tax or $12.50 per share. Based on the above price, the stock now sells for 12.7 times 2019 earnings. If the profit stagnates at these levels then it will take 12.5 years to recover an investment in the stock assuming all profits were paid out to shareholders. Investors will compare this PE ratio of 12.7 with the overall market which is now at 16 as well as against other stocks. If other stocks are selling below the value of NCB then it may be better to go after those, all things being equal, they should provide a better return on investments. While the PE is best used in the stock market it can be used in the money and real estate markets as well. Sagicor Equity linked Unit Trust delivered almost 600% gain in 10 years. Sagicor Equity Unit Trust is Jamaica’s leading unit trust equity portfolio for the past six and ten years periods. In second place is Scotia Unit Trust, followed by Barita, data compiled by IC Insider.com shows. For the past 6 years, Sagicor delivered gains of 339 percent and 581 percent over the past 10 years with nearly three months to go for the period. 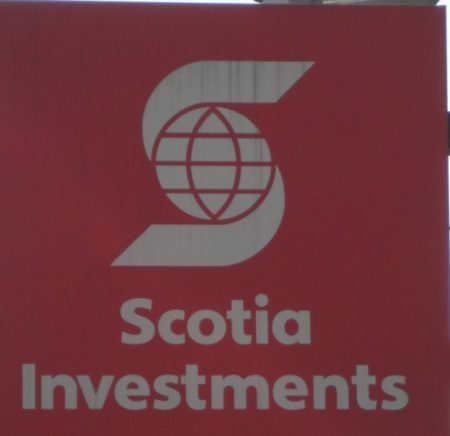 Scotia Unit Trust had gains of 237 percent for the near 6 year period and 429 percent for the 10 year, period with just under three months of the period to go. 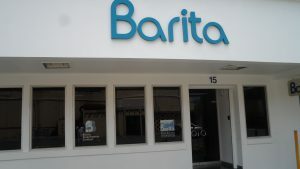 Barita is third with 341 for the near ten years and 209 for the 6 years period. 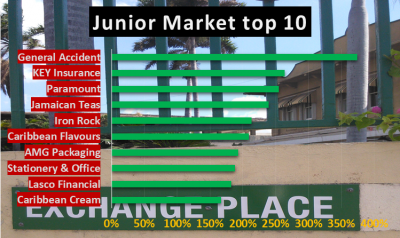 The Jamaica Stock Exchange main market gained 31 percent to Friday October 12 and the Junior Market 23 percent and the year still has more than 2 months to go. 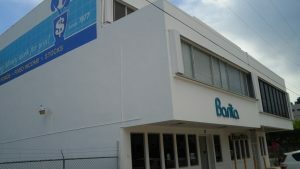 At look at the unit trust performance as disclosed in Friday’s Financial Gleaner, dated October 12, shows, Barita Unit Trust leading all others with an increase of 29.77 percent followed by Victoria Mutual Fund with a return of 25.28 percent and Sagicor coming in third at 18.95 percent. 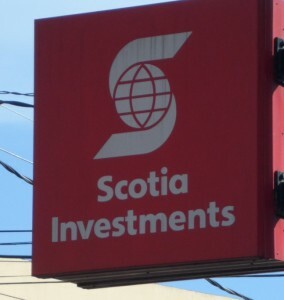 Scotia Investments Capital growth Fund tops in 2017. 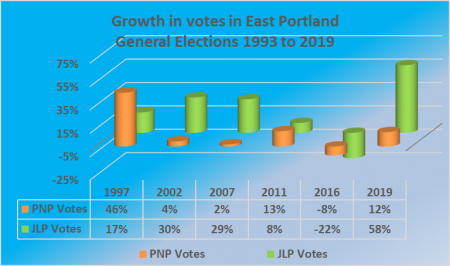 With interest rates at the lowest levels on record and the increased risk for ordinary Jamaicans to invest in US dollars with two ways movement of the local currency, more persons are looking at the stock market as a viable alternative. Not everyone is equipped to buy stocks directly. Equity based unit trust schemes are useful alternatives for investors to look at if they are not comfortable with investing directly in stocks listed on the local market. These schemes invest in a variety of stocks and keep some funds liquid to be able to meet persons cashing out. This latter factor alone usually ensures that unit trust will find it tough to beat the market. But that should not be of major concern to many investors who would not be able to benefit from the power that stocks can deliver to one’s portfolio. Put another way if an individual investors decided that they are not conversant with stocks and therefore invested their funds in fixed interest securities at say 5 percent per annum but got say 20 percent from a stock fund as opposed to 30 percent from the stock market they would still be far better off than not owning some instruments that are exposed to the stock market. One period’s performance is not the best guide to selecting a unit trust to invest in. In 2017, Scotia Premium Growth Fund recorded gains of more than 37 percent for their investors to be the number 1 performer, after rising 25 percent for 2016. The Scotia Fund, displaced Barita Capital Growth Fund, the 2016 front runner that ended at number 6 in 2017, while still delivering a 21.5 percent return, down slightly from 26.7 percent in 2016. Funds delivering good performance over longer periods are far better guide in selecting a unit trust for investment. Over the past 5 years to 2017, no one unit Trust has been consistently the top performer. Barita has held number one spot in 2013 with 11.79 percent, they were number 2 in 2014 with 9.13 percent, three in 2015 with 51.27 percent and number one in 2016 with 22 percent but fell to 6th position in 2017 and are now number 1 in 2018. Scotia Premium Growth were no 1 in 2017, number 2 in 2016 with an increase of 26 percent, number 2 in 2015 with a 62.7 percent increase, 3 in 2014 with an increase of 8.3 percent, 3 in 2013 with a decline of 3.8 percent and are now 4 in 2018 to date. Sigma Unit Trust was number one in 2014 with a gain of 12.6 percent and in 2015 with 89 percent, number 4 in 2016 with negative 2.7 percent growth, second place in in 2017 and number 3 in 2018 so far. The bulls have taken control of the Jamaica Stock Exchange, driving the main market to several new record highs during the past week with All Jamaica Index hitting more than 352,000 points last week Friday and jumping more than 6,000 points on Tuesday morning this week to more than 356,400 points and hitting a high of 363,496. At the same time, the Junior Market now trades at a 15 months’ high. The bullishness has also raised the PE ratio of the market higher since the start of July. The average PE for the overall Junior Market is now 13, based on 2018 estimated earnings. The main market PE, is now an average of 13.7. 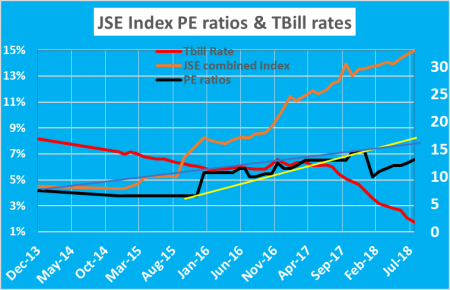 At the start of July, the PE ratios, were at 11 for the Junior Market and 13 for the main market. At the end of 2017, the average PEs were at 13.5 and 15 respectively, based on 2017 earnings. The PE is the most used tool in valuing stocks. in order to compare the value of one stock versus another, as such paying attention to this most important measure is critical to success in the stock market. PE ratios are not static and will change as profit and interest rates change. Profit will drive a stock to an expected or accepted PE but interest rates will change PE depending on whether rates and rising or falling. 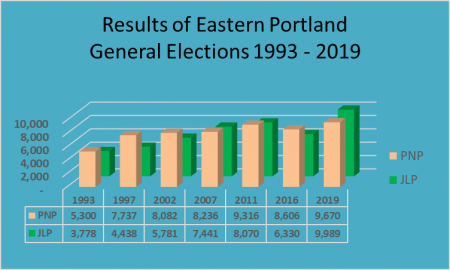 For several years Jamaican became used to a PE of 10 being the norm. That was when interest rates were in the teens now that rates are down sharply from that level PE will rise but its taken quite some time for that to happen. Investors are slowly recognizing that to participate in a growing economy and rising profits that they have to pay more to buy the shares of the listed companies. 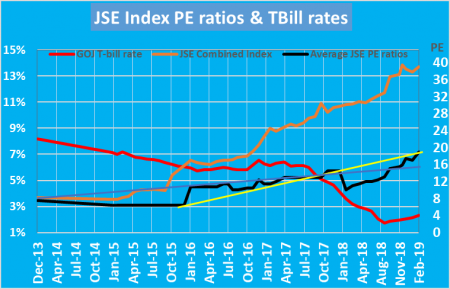 The attached chart suggests that the average PE ratio is likely to end 2018 around 16 TO 17 times earnings, as investors continue to gradually upgrade the multiple they are prepared to pay for stocks, which would lift prices sharply over the coming months, from current levels. Treasury bill rates now under 2 percent and government 4 years bods clearing at 3.95 percent and with a chronic shortage of many of the stocks, continuing to put upward pressure on prices, the PE ratios will move higher, investors should be taking their cue from this development. The movement of the markets PE to the range mentioned above would translate to and increase around 25 percent rise in the market for the rest of the year and would result in full year gains of 40 to 50 percent in main and Junior markets for the year. At the start of June, investors could pick up PanJam Investment shares at $45 and theoretically sell off the 31.56 percent holdings in Sagicor and own each PanJam share for just $1. A few weeks on, the proposition is more expensive to achieve as it would cost $8 to achieve the same objective. Based on the lack supply of PanJam shares on the market it could become even more expensive in the weeks and months ahead. While that anomaly exits, there is the wield situation in the local stock market where prices seem to be mismatched. Jamaica Producers (Producers) is selling a PE around of 25, well above the market average of 13 currently, but below Kingston Wharves (KWH) at 30. 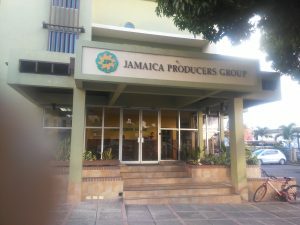 Jamaica Producers owns 50 percent of KWH with half of its market value being $33 billion. Producers is valued by the market at $19 billion well below its half of KWH. It would require a 74 percent price gain in Producers to equal the value of their holdings in KWH, assuming the latter remains around the current price of $46.55. 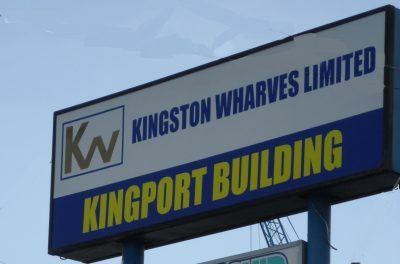 Kingston Wharves trades at 30 times 2018 earnings. Another fascinating finding is that Junior Market listed Access Financial Services with market capitalization of $12.77 billion is almost twice the size of Mayberry Investments of just $7.8 billion. Mayberry formerly owned over 40 percent of Access before selling it off to Proven Investments. Mismatching is also evident in the junior market with Cargo Handlers and Knutsford Express selling well above the market for more than a year, even after their prices have slowly declined over that period. Everything Fresh has now joined the group of highly valued stock with PE in excess of 20 times 2018 earnings. With Treasury bill rates just under 2.5 percent and heading lower PE of 20 should now be common place, but when the market is selling well below then it raises some questions about how well investors are pricing stocks. A keen look at these high priced stocks is that with exception of KWH the prices have not gained in over a year and in fact some have fallen while others in the market have recorded strong gains. Some of these stocks seem poised to under perform the market for awhile, until time and increased earnings better align their values with the rest of the market. “Hello my dear client, the day we have been waiting for to increase your wealth is here. 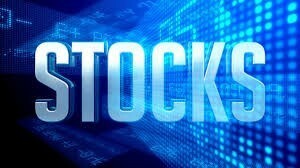 The Mayberry Jamaican Equities IPO has finally arrived, the stock is a must have at this time. Attached are the Prospectus and Application Form for your attention. The official opening date is Monday, July 9, 2018, the demand is high so please don’t delay,” Kind regards, a MIL wealth adviser. The above was a message sent out by one of Mayberry’s wealth advisor. A group of investors stated in 2017 that investors cannot go wrong with Junior Market IPOs, all that has to be done is just buy, buy, buy and the investor cannot fail to make money. Some investors in the last two IPOs, Sygnus Credit and Everything Fresh bought into the issues heavily, hoping to catch an early bounce and pocket the profit. That the initial bounce did not last, should be a lesson to speculators. %8 Half Way Tree Road owned by Stanley Motta. Laden with 6 main and Junior Market stocks, Mayberry Jamaican Equities is issuing 120,114,929 ordinary shares to the public, at a price of $7.57 each. Investors really ought to know what they are buying into when IPOs are being issued, rather than thinking that the price of each IPO can only go in one direction – up. As the stock market matures and more persons come to the party of stock ownership, the valuations that new IPOs come to the market at, will continue to rise and less immediate potential gains will be priced in. In some cases, investors will need to look long term for the payoff from their investment. 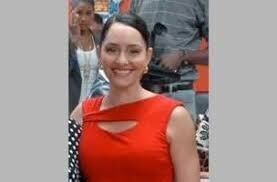 Everything Fresh, Sygnus Credit, Stanley Motta and Mayberry Jamaican Equities fall into this category. GWest was another company that many investors got carried away with, in pushing the price to $4 with many buying at inflated values, now the stock trades in the low $2 range. A reminder of an adage, that successful trading starts at buying at the right price. GWest business model is based mainly on generating most income and profits coming from operating mini hospital and other patient care. Real estate income going forward was going to be secondary and would not contribute much to profit. Profit made in the year before listing was mostly from sale of real estate and that was not something that would continue for any prolonged period. Without a track record in providing healthcare, investors who bought the stock in the high $3-4 level must have been hoping that the forecast in the prospectus was going to be achieved on a timely basis. The results to March show revenues well below forecast from the new operations. 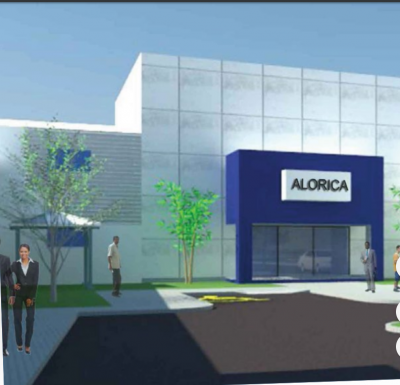 The company projected medical income to March this year, at $86 million but only generated $17.4 million and that puts the issue of generating the forecasted $710 million for fiscal year 2019, in doubt. Admittedly, the company had projected a loss to March of $110 million but came up sharply lower with a loss of $88 million. 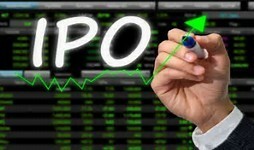 Investors should recognize that not all IPOs are equal. They should also realize that there is a clear pattern that prices then to move up for strongly demanded issues and the undergo some correction. The data shows that the best time to buy after the IPO closes is on the first day or two or a few weeks after when demand falls off and supply increases as short term investors try to offload. Data for listings in 2016 to 2018 show and average of 31 percent correction for Junior Market stocks from the highest point to the lowest, after listings which tends to occur within 4 weeks of listing. IPOS from Mayberry seem to have a lower pull back in price, around an average of 23 percent while most others, average around 33 percent. Three main market stocks pull back from their highest point, range from just 15 percent for Victoria Mutual Investments to 31 percent for Wisynco and 29 percent for Sygnus Credit Investments. Based on how investors have gone about pricing IPOs at their peak it seems likely that Indies Pharma will peak around $2.40 based on projected earnings in 2018, of 16 cents per share. It could even go higher if the number of investors who apply for shares exceed those Junior Market listings IPOS from those going back to 2018. Many investors could dramatically improve returns on their stock market investment if they ranked stocks listed on the market. Ranking helps to better identify those with the greatest potential to grow and those that do not, within a limited time frame. Many investors grapple with selecting the most appropriate stocks to buy or sell but many if they ranked stocks in the market, could see a marked change to their results. It would also give them a great guide as to when to sell. Most they know when to buy, but have difficulty in determining when to sell. Ranking solves that. Investors should pay attention to all stocks in the market, especially when the companies report results. Financial results may have coded message about future earnings. Some factors to look for in results that could provide big advantage for keen investors are results with one off income or expenses that make them look better or worse than if those cost or income were not included. In short, results should be stripped to show earnings from continuing operations. Ultimately stock valuation will be based on continuing earnings. Strength in revenue growth is a very good place to start, the higher the increase the better the future may look especially if costs are rising much more slowly than revenues. Investors should pay attention to those stocks that rise or fall and try and identify the reasons for the movements, especially if the movement is over a few days rather than the one day up and the other day down change. Get help from a broker or a friend who are likely to know, to get a better understanding of price movements. Investors can use information in IC Insider.com’s stock market report charts that show the PE ratio of each stock. The TOP 10 charts rank stocks starting with the ones showing the highest likely return at the top followed by next in line and so on. Ranking stocks to show those with the best and worse performance over the next 12 months, is one of the best ways to make money in the market. Junior Market TOP 10 stocks ranked in descending order of potential gains. It is highly recommended, as it has worked very well historically in eliminating the noise that is inherent in stock selection when they are not ranked. Those with the best ranking tend to take longer to rise as they tend to be out of favour for a while but usually they do and go on to provide big gains. 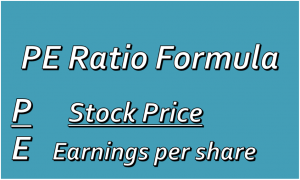 Focus should be placed on stocks with the lowest PE ratios. Rising stock prices increase the PE and falling prices will tend to reduce the PE. The crude rule of thumb is that stocks with the lowest PE ratios are better buys for maximum appreciation with the reverse being true. While investors should be looking for low PE stocks to invest in, some of the best stocks to invest in are those with rising income and profit, they could probably be very good stocks to invest in for a longer period and ensure a greater chance of long term gains. 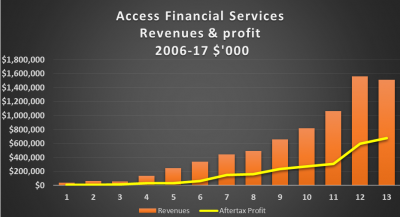 The historical performance of Access Financial is an excellent example to observe as it has demonstrated consistent high annual growth in revenues and profits and stock price.